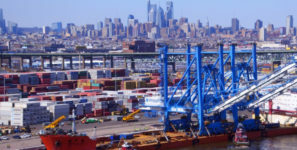 OCEMA DISCUSSION AGREEMENT TO GO INTO EFFECT AT PORT OF NYNJ ON THIRD TRY: In January, the FMC rejected the agreement for failing to disclose information while a filing made June 2016 was withdrawn after the commission requested additional information. NYNJ OCEMA discussion agreement to become effective Sunday, June 25. Two FMC commissioners voted to seek additional information to assessing competitive effects of OCEMA agreement. Two FMC commissioners voted not to require additional information on OCEMA at this time. A tie vote yesterday at the Federal Maritime Commission will not prevent the Port of New York & New Jersey/OCEMA Discussion Agreement from going into effect this Sunday, June 25, 2017. A majority vote is required for the commission to take action on an agreement. The tie was made possible by the departure of former FMC chair Mario Cordero who took a position at executive director of the port of Long Beach. President Donald Trump has since appointed Commissioner Michael Khoury to succeed Cordero as chair, still leaving four of five seats in the commission occupied. Two of the commissioners voting yesterday were concerned about the significant market share that Ocean Carrier Equipment Management Agreement (OCEMA) members and its individual carriers control at the ports of New York and New Jersey and voted to seek additional information that would assist the agency in fully assessing the competitive effects and consequences of the agreement. Two commissioners voted to allow the agreement go into effect without requiring additional information at this time. In January, the FMC rejected an OCEMA discussion agreement for failing to meet legal information disclosure standards. That agreement was filed with the FMC in November 2016. Before that, an agreement was filed for FMC consideration in June 2016, but was withdrawn in August after the commission issued a request for additional information. The agreement authorizes the Port Authority and OCEMA to collect and exchange information, discuss, and reach agreements on matters relating to cargo throughput, safety, intermodal equipment supply and efficiencies, congestion relief, port and terminal infrastructure, financing of improvements, and clean air or other environmental initiatives affecting operations in and around the Port of New York and New Jersey. In January, former commission chair Cordero voted to stop the agreement from going forward, suggesting at that time that a more narrowly tailored discussion agreement would have met with his approval.